This is a lesson plan that starts with a discussion and ends with a speech. The aim is to engage your students and talk about topical issues – now, as the lesson progresses, it should come apparent that the speech and issues have been around for rather a long time. Feel free to chop and change it, it’s timed at about 2 hours + as it stands. Ask your students to define the word “Freedom.” Tell them every opinion is valid – write answers on the board. Correct any grammatical mistakes. Follow-up with – What recent conflicts resolutions and uprisings have come as a result of the desire for freedom? (If you happen to be in one of these countries, use…carefully). Cut out and give your students the following sentences taken from a speech. Ask them to put them in the correct order – it’s not an easy task, so make sure they justify their answers. Greed has poisoned men’s souls; has barricaded the world with hate; has marched us into misery and bloodshed. We have developed speed, but we have shut ourselves in. Machinery that gives abundance has left us in want. Our knowledge as made us cynical; our cleverness, hard and unkind. We think too much and feel too little. More than machinery we need humanity. More than cleverness, we need kindness and gentleness. Without these qualities, life will be violent and all will be lost. The aeroplane and the radio have brought us closer together. The very nature of these inventions cries out for the goodness in man; cries out for universal brotherhood; for the unity of us all. To those who can hear me, I say “Do not despair.” The misery that is now upon us is but the passing of greed, the bitterness of men who fear the way of human progress. The hate of men will pass, and dictators die, and the power they took from the people will return to the people. And so long as men die, liberty will never perish. Do not correct their answers yet, they will do this themselves when they listen. Ask them to define the underlined words or phrases using the context. Write their definitions on the board and give them guidance where necessary. Next, get your students to discuss what kind text they think it is and why. Hopefully they’ll tell you it’s a speech. Ask what rhetorical devices the writer uses to make an argument. Rule of three – using three consecutive ideas to make a rounded point – for example “Tell me and I forget. Teach me and I may remember. Involve me and I will learn” – Confucius. Amplification – repeating a word or phrase and adding more detail to it, “I am a lion, I am a ferocious, blood-thirsty lion.” – some lion. Contrast – two opposite ideas in one sentence. “We enjoy freedom, not slavery“. The rule of 3: – Greed has poisoned men’s souls; has barricaded the world with hate; has marched us into misery and bloodshed. Amplification – Even now my voice is reaching millions throughout the world, millions of despairing men, women, and little children, victims of a system that makes men torture and imprison innocent people. Get feedback from the students and guide them if necessary and follow-up on difficult vocabulary. What kind of person gave this speech? What issues does it touch upon? When do you think this speech was given and why? They should discuss these questions in groups, then feedback to the class as a whole group. The students should listen to the speech in two parts. 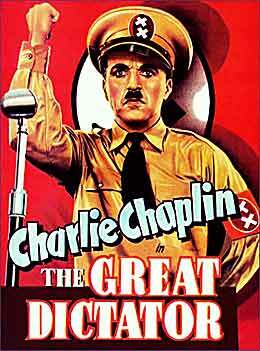 First to check they have their sentences (stage one) in the correct order and second to fill in the gaps: Download the PDF – The Great Dictator PDF gapfill. Also, if you wish to create your own version – the speech is readily available online. Play video until 02.58 – (note the sentences above are slightly abridged). Make sure all your students have correctly ordered the sentences. Find out their reactions – are they surprised that the speech was so old (C.1940)? Why / why not? How does the speech make them feel? Part two – play to the end. Students must then complete the gap fill. Discuss the questions as a group. How far do you agree with the points made in the speech? Is Chaplin still relevant today? I’m including a couple of practice exercises you could use with your students. Have a look to see what else you can find online, so they can give it a go at home. If you find anything worthwhile, include it in the comments below. You might also want to mindmap some ways of “signalling” with your students, and also perhaps ask them to give you some more examples of amplification. Students write a speech on a topic of their choosing – including the five rhetorical devices they looked at previously. Mindmap some topics together and get each student to speak about something relevant to their lives. It wasn’t Benjamin Franklin who said: “Tell me and I forget. Teach me and I may remember. Involve me and I will learn” – Benjamin Franklin. It was Confucius. Hi George, I just wanted to say thanks for your site, I use it a lot when I don’t have time to think and make lessons myself. It’s a great resource and the lessons are really well thought out. We appreciate any and all feedback, but it doen’t come all that often – so that’s great to hear! Oh I don’t believe it doesn’t come all that often, your site is really fantastic! I am actually going to use this liberty lesson for a 1-on-1 class tonight, should make for interesting conversation considering North Korea is 50 miles up the road! Thanks for adding AlienTeachers to your blog roll, it’s really appreciated. I’m pretty sure Designer Lessons is already in mine, I’ll double check now! I used this today with my 1 to 1 advanced student, and I must say it went swimmingly!!! I’d been struggling to find a subject matter with some grammar points that would be challenging for him – and this one worked well. Even though we had internet malfunctions – we were able to skip the listening because our class is only 1 hour, and he’d seen the movie before and promised to watch the speech clip when he got home. We focused instead on the grammar devices for speeches & the concept of inversion. The problem with hitting a home run in these lessons is that it’s so hard to follow them up… oy the pressure. Thank you so much for this! I’m an ESL teacher in Venezuela and this lesson fits perfectly around what is currently happening in my country. I appreciate all the hard work behind it! Thanks for your kind words Karolina – and I hope the situation improves in Venezuela.